A fine Antique Early 19thC Davenport Writing Desk in figured mahogany, stamped James Winter & Sons 151,153,155, Wardour Street, Soho, London. Superb condition and highly original, down to the original dark red leather writing surface. Comprising a sliding writing slope with fitted interior, four opening drawers to the right hand side and four dummy drawers to the left hand side and a pull out slide to the left hand side. 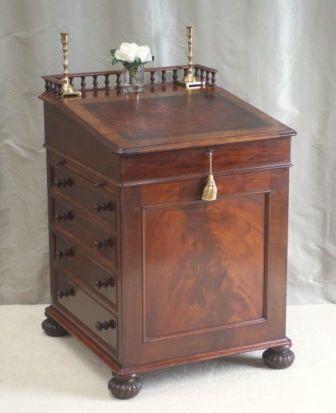 This fine Antique Davenport Desk sits on reeded bun feet with original concealed castors and brass wheels underneath. This desk also has a pull out pen drawer to the upper right hand side. The sliding top has a low turned wooden gallery.